HandPunch 4000 provides full time and attendance function with the most accurate technology. Wipaq offers an unmatched selection of quality HandPunch 4000 machines with various features like Employee messaging, Review of employee information fields, Validation tables to ensure proper data entry, Restrict employee access to specific data management keys, Edit-at-the-Clock Functions, Decision menus to minimize keystrokes, Multi-level input sequences definable per key and User defined prompts! 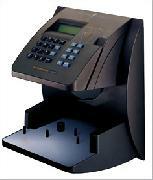 HandPunch 4000 comes with Built-in Bar Code Reader for Badge verification process. HandPunch 4000 are versatile and programmable. Their ability to go from 530 Users to 3498 Users makes them ideal for operations as varied as a commercial industry and government workplaces. And HandPunch machines from Wipaq can be used in many different places! Employee info. fields, 24 max.